The Kanbar Center at the Osher Marin JCC is proud to present the Grammy Award-Winning contemporary string quartet: Kronos Quartet. Re-imagining and redefining the string quartet experience. 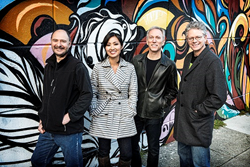 For more than 40 years, San Francisco’s Kronos Quartet—David Harrington (violin), John Sherba (violin), Hank Dutt (viola), and Sunny Yang (cello)—has combined a spirit of fearless exploration with a commitment to continually re-imagining the string quartet experience. In the process, Kronos has become one of the world’s most celebrated and influential ensembles, performing thousands of concerts worldwide, releasing more than 60 recordings, collaborating with many of the world’s most eclectic composers and performers, and commissioning more than 900 works and arrangements for string quartets. A Grammy winner, Kronos is also the recipient of both the Polar Music and Avery Fisher Prizes. With a staff of ten, the nonprofit Kronos Performing Arts Association (KPAA) manages all aspects of Kronos’ work, including the multi-year education and legacy project Fifty for the Future: The Kronos Learning Repertoire, which is commissioning—and distributing for free—the first learning library of contemporary repertoire for string quartet. WHAT: A unique, brilliant and contemporary string quartet experience. WHEN: 5:00 p.m. on Sun. June 11 ~ Doors @ 4:30 p.m. The Kanbar Center for the Performing Arts is the Performing Arts Department within the Osher Marin Jewish Community Center in San Rafael, California. For close to 25 years they have spread the power of music, voice, humor, taste, culture, movement and words throughout the community by presenting classical music, comedy, musical concerts, jazz, theater and performance in the grand Hoytt Theater, along with lectures, chats and demonstrations in the Kurland lounge, and great world music & dancing for all ages outdoors under summer skies on Swig Field. All are welcome; no membership is required to attend. The Center is a long-standing Marin non- profit, centrally located in Marin County and just a quarter mile east off Hwy 101.